Serviceberry trees and shrubs (Amelanchier spp.) are members of the Rosaceae family. They are deciduous and found throughout the Northern Hemisphere. They offer four-season interest with their beautiful blossoms, pome fruits, autumn leaf colors, and bark color in winter. Botanists have had a hard time sorting out the different species in this genus because of hybridization and the fact that these plants can produce seeds asexually (without being pollinated) through a process called apomixis. Some of the species may actually be subspecies or hybrids of other ones. The name serviceberry is thought to derive from church services and its blooming season, notes the Maryland Department of Natural Resources. At that time of year, the weather was better and traveling pastors were able to visit the church circuits, or it was Easter season. Some even say people knew that when the serviceberries were in flower, the ground had thawed enough to dig a grave. The common name of Juneberry is sometimes used because the fruit will start ripening during that month. The common names shadbush, shadblow, and shadwood refer to the fish that runs and spawn while these plants are blooming. 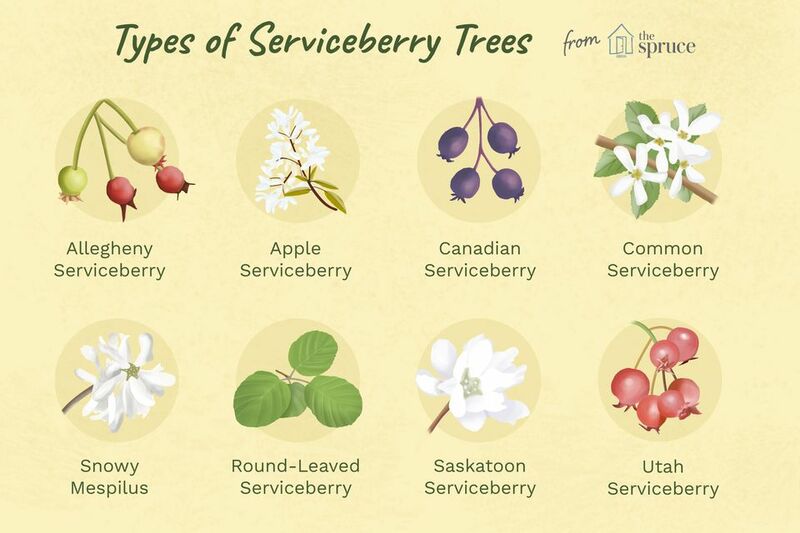 Other names you may see are sugarplum, Indian pear, May cherry, saskatoon, sarvisberry, wild pear, wild plum, and chuckley pear. According to "The Berry Bible: With 175 Recipes Using Cultivated and Wild, Fresh and Frozen Berries" by Janie Hibler, the origin of the name Amelanchier is the Celtic word gauloise, which translates to "small apple." Both apples and serviceberries are pomes, making this an apt comparison. Over time this transformed into the French Provencal name of amelanche, which was used for the snowy Mespilus (Amelanchier ovalis). The flowers are typical of the Rosaceae family in that they have five petals surrounding many stamens. Most species feature white blossoms, though some varieties can feature shades of red and yellow. The purple pome fruits are edible and can be eaten fresh or used to make jams or jellies. These shrubs are a great choice for inclusion in the landscape if you want to attract birds to your garden since they love the fruits. Amelanchier species can serve as a host for cedar-quince rust, cedar-serviceberry rust, and cedar-hawthorn rust, which are caused by Gymnosporangium species. They may also be attacked by fire blight, powdery mildew, Entomosporium leaf spot (Entomosporiumspp.) and cankers. Witches'-brooms can also form. Potential pests include aphids, borers, deer, Japanese beetles, leafminers, mice, pear slug sawfly, plum curculio, rabbits, scales, spider mites. Birds may be considered a pest if you prefer to keep the fruits for yourself. Another potential problem with this genus is that it forms suckers. This can be a useful trait if you want to create masses in your garden, such as found in native landscapes, but you may need to control the suckers if they overtake other plants. The Allegheny serviceberry may form into multiple trunks and is one of the tallest Amelanchier species. If you prefer it to be a small tree, use pruning to create a central leader that will serve as the main trunk. This species grows best in locations with moist soils with proper drainage. This species has some color interest throughout several seasons. In spring, it bears clusters of white flowers. During summer, the fruit begins to form, ultimately becoming bluish-black. In autumn, the leaves will change to be red or yellow. If you want a tree with a fastigiate shape, or column-like, look for the "Snowcloud" variety. Other varieties available include "Cumulus," "Prince Charles," and "R.J. Hilton." 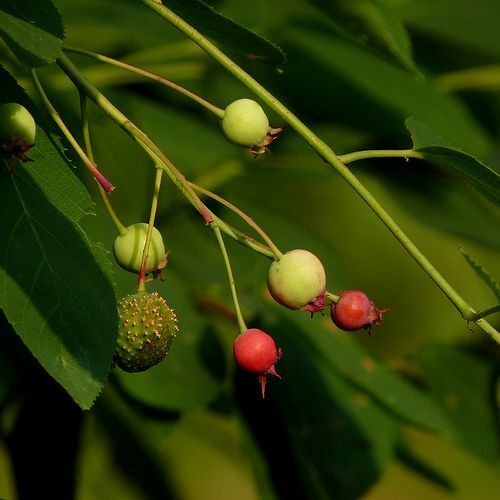 The apple serviceberry is a result of a cross between the downy serviceberry (Amelanchier arborea) and the Allegheny serviceberry (Amelanchier laevis). You can prune it to have one truck to be in tree form or leave it as a multistemmed shrub. The white blossoms are especially large on this hybrid. You can plant this as part of a drought tolerant garden. Fall foliage colors are red and yellow. The variety pictured is "Cole's Select." "Autumn Brilliance" offers red-orange foliage in the fall and resistance to diseases. You may also see "Autumn Sunset," "Ballerina," "Princess Diana," "Prince Charles," "Prince William," "Robin Hill," and "Rubescens." The Canadian serviceberry is hardier overall than other species. Choose a location with moist soils that offer good drainage for best results, though it can still grow if the soil is dry. However, it will struggle if drought conditions are present. This tree will put on a fall show when the leaves transform to become orange-red, gold, or yellow. The white flowers appear around the middle of April and bring butterflies and bees into your garden. Available cultivars include "Glennform" (known as Rainbow Pillar), "Prince William," "Sprizam" (known as Spring Glory) and "Trazam" (known as Tradition). If you are looking for a serviceberry with large fruit, choose this species. It forms several trunks so a central leader will be needed if you prefer the look of a tree. Downy serviceberry tolerates pollution, making it suitable for urban landscapes. The leaves can be fuzzy when they first appear. In the fall, they are yellow, red, or orange. There are three different varieties that naturally occur. Amelanchier arborea var. arborea is known as the common serviceberry. The Alabama serviceberry is known as A. arborea var. alabamensis. Finally, the downy serviceberry is A. arborea var. austromontana. Which Trees Will Deer Generally Leave Alone? It is unknown whether this is its own species or the result of a cross between other Amelanchier species. In the fall, the leaves will change to red and orange. This serviceberry was a recipient of the Award of Garden Merit from the Royal Horticultural Society. The species name of lamarckii was given for Jean Baptiste Antoine Monet de Lamarck, who was from France and lived in the 1700s. It has shown the potential to become invasive in some areas of Europe. The species name of sanguinea means blood red and is used because this shrub has red twigs. This characteristic can be used to distinguish it from other species. The white flowers are fragrant and appear early in spring. There are three different varieties that you may come across. They are Amelanchier sanguinea var. grandiflora, A. sanguinea var. gaspensis and A. sanguinea var. sanguinea. The next page features the Saskatoon serviceberry, which some botanists classify as Amelanchier sanguinea var. alnifolia. A species name of alnifolia lets you know that the leaves are similar to those found on alder (Alnus) species. This species tolerates cold temperatures well. In fact, there is even a variety available ("Altaglow") that is able to grow in chilly zone 1. USDA Zones: 5 to 9. May be able to grow in zone 4 with protection. This small shrub is covered with clusters of white flowers in the spring. The fruit is a rich purplish-blue hue when mature. Ovalis means oval and likely refers to the shape of the leaves. For a dwarf variety, select "Pumila." Another variety that may be available is named "Edelweiss." This is one of the more drought tolerant serviceberries. Spring brings white flowers. In summer, the fruit is formed and matures to be purple-black. In the fall the green leaves will shift to shades of yellow. It serves as an important source of food for wildlife.